Wherever sources of sparks or excess heat are present, substances such as gases, petroleum products and airborne dusts or fibres pose a serious risk of triggering an explosion and subsequent fire. To minimise these losses, regulatory bodies around the world have worked to refine standards that will mitigate the spark flash potential that can be found in these working environments. By Bharat Shenoy, Littelfuse. Limiting exposure to high surface temperatures and requirements for energy limitation are key aspects of the UL 913 standard. Originally issued in 1971, UL 913 establishes the standard for “Intrinsically Safe Apparatus and Associated Apparatus for Use in Class I, II, and III, Division 1, Hazardous (Classified) Locations” (see Table 1 for details). It specifies requirements for the construction and testing of electrical apparatus, or parts of such apparatus, having circuits that are not capable of causing ignition in Division 1 Hazardous (Classified) Locations as defined in Article 500 of the National Electrical Code, ANSI/ NFPA 70. It does not cover mechanisms of ignition from external sources, such as static electricity or lightning, or apparatus based on high voltage electrostatic principles, such as electrostatic paint spraying apparatus. In Class I hazardous locations, flammable gases or vapours can be ignited by sparks caused by electronic switching, arcing or high surface temperature of the apparatus devices. For Class II and III hazardous locations, the greatest area of concern is if the temperature is higher than the ignition point of the combustible dusts. For example, if the surface temperature of the apparatus doesn’t exceed 120°C (under normal operating conditions) and 165°C (under fault conditions), a device is considered safe because it isn’t capable of causing ignition due to high surface temperature. What creates the potential for an explosion? Energy production: oil/gas production/refining/storage/transportation, coal mining, etc. Materials processing: chemicals manufacturing, semiconductor fabrication, tank farms, fertiliser plants, machine shops, etc. Food production: grain storage and milling, baking, brewing, distilling, etc. Others: manufacturing of pharmaceuticals, cosmetics, pesticides, pumping stations (gas, oil, sewage), etc. Within potentially explosive areas, production and maintenance personnel rely on variety of electronic devices to do their jobs, including motor controllers, lighting products, mobile communication handsets, flow meters, process control and automation equipment, sensors, industrial computers and many others. Under normal operation, these apparatus can generate tiny internal sparks from components such as motor brushes, switch contacts and connectors. To use electronic apparatus safely in a hazardous location, the energy of such sparks must be contained to avoid igniting explosive materials in the environment. Today, the use of devices that are certified as Intrinsically Safe (IS) is a requirement of operating electronic equipment in potentially explosive areas. Many different types of intrinsically safe apparatus have been developed over the years for use in a variety of industrial settings to prevent potentially explosive substances from coming into contact with sources of ignition. These apparatus are designed to prevent contact in two ways: through energy limitation (i.e. to contain the spark energy) and through temperature limitation (i.e. to limit the surface temperature of devices). Intrinsic safety standards are applicable to the signal and control circuits that can operate with low currents and voltages, but not to high-powered circuits such as electric motors. Intrinsically safe certified devices are those designed in such a way that they are incapable of generating sufficient heat or spark to trigger an explosive event. When an abnormal condition such as a capacitor failure or an IC short occurs in an electronic circuit, it creates an electrical fault that can cause thermal runaway if it is not controlled quickly. This may generate a spark or cause a component’s temperature to rise rapidly, either of which can be extremely hazardous, particularly in an industrial setting with potentially explosive gases, fuels or combustible dusts/fibres. The solution is to use a fuse, which is an intentionally weak link designed to open the faulty circuit, thereby limiting the spark energy and surface temperature. However, a regular fuse does not provide sufficient protection because arcing can occur when the fuse opens. Instead, an intrinsically safe certified fuse is necessary to limit the current under any abnormal condition to ensure that the circuit will open without generating a spark capable of causing ignition. The surface temperature of the fuse also must be kept below the temperature that could ignite explosive gases or dust. Preventing the temperature of a component inside equipment such as gauges, meters and valves from rising to an unsafe level is another aspect of ensuring intrinsic safety. Under fault conditions, the temperature of an internal component such as an IC or capacitor can rise much higher than under normal conditions. An intrinsically safe fuse or current limiting resistor is required to ensure that no component in the circuit can reach a temperature that could ignite an explosion. Until quite recently, manufacturers of intrinsically safe apparatus that included fuses in their circuit board designs were forced to send their boards to a third-party supplier or create their own secondary process to pot or spray them with an insulating coating to meet the requirements of the UL 913 standard. This increased manufacturing time and costs, which was particularly significant for boards in which the only potential source of ignition was the fuse. 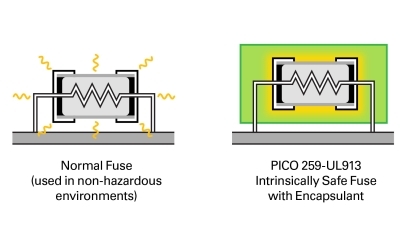 New options for IS apparatus designers include encapsulated fuses, such as the PICO 259-UL913 series intrinsically safe fuse, a range of encapsulated fuses approved under the UL 913 standard for use in intrinsically safe electrical equipment to operate in hazardous locations. The fuse is suitable for applications with voltages up to 125Vrms (190V peak). Sealed fuse designs such as these are well-suited for use in a wide range of applications because they can operate safely within environments where there is danger of explosion from faulty circuits. The fuse is sealed in an encapsulant more than a millimetre thick, which prevents high temperatures from reaching the device’s outer surface during normal operation. The encapsulation also prevents hazardous gases and dust from entering the fuse body and potentially igniting if the fuse opens, so it can also be used in Class I areas where flammable gases or vapours are present. This eliminates the need for an added conformal coating of the PCB where the fuse is placed. The encapsulation also limits the surface temperature of the fuse during operation, which allows it to be used in Class II and III environments where flammable dust particles are of concern. For designers of intrinsically safe apparatuses, incorporating these new fuses into their circuit protection plan can eliminate the time and expense once involved in adding insulation as a secondary process. It also dramatically simplifies testing to certify the apparatus under UL 913 because all testing related to fuse safety can be waived, reducing cost and development time. About the author: Bharat Shenoy began working in the circuit protection industry began in 2001 and joined Littelfuse in 2008, where he is currently Director of Technical Marketing. Bharat has a B.S. in Naval Architecture from the United States Naval Academy and served seven years as a Naval Officer in the Nuclear Submarine fleet.